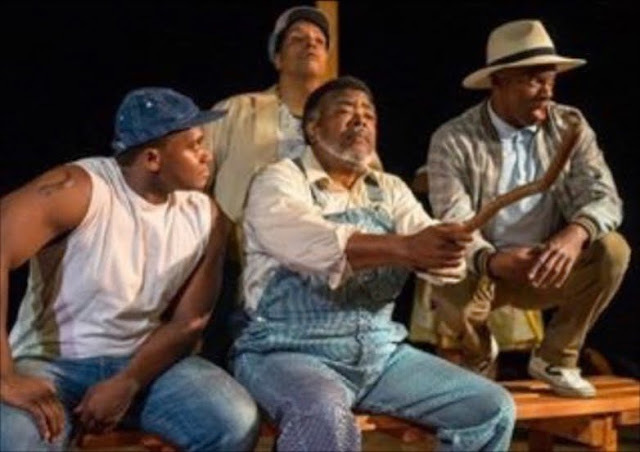 Carol's Theatre Reviews ~ It's Fun To Go Out: Emmett Till’s Ballad: A tragedy in real time. Emmett Till was fourteen years old when he was lynched, dragged out of bed in the middle of the night, forced to carry a 75 pound cotton gin fan to the banks of the Tallahatchie River and undress. The lynch mob then nearly beat him death, gauged out his eye, shot him in the head, tied his body to the cotton gin fan and threw him in the river. His crime: Allegedly he whistled at a white woman …in Money, Mississippi. The time, 1955. Fourteen-year-old Till was by all standards a typical teenager. Somewhat spoiled by his single mother Mamie; he grew up on the South Side of Chicago and was a happy go lucky kid, but had ants in his pants. It was summer vacation and he wanted to go south, Mississippi to be exact. His mother grew up there but moved to Chicago’s thriving Black community on the South side years prior, but relatives remained. Unlike Till’s urban upbringing, they were cotton farmers. They raised chickens, and picked cotton something young Emmitt could not fathom especially the ‘chicken thing’. But, Emmett wanted to spend the summer with them. Over her objections, protestations and careful instructions on how NOT to behave when among the whites in the Deep South, he headed to Mississippi. With the exception of a trip back home in a casket it was the last significant journey this fourteen-year-old would take. 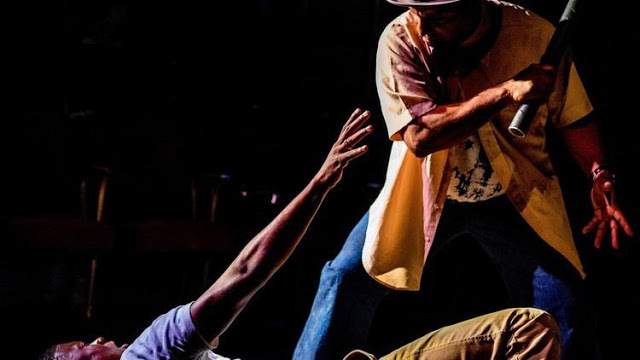 Playwright Ifa Bayeza has penned an emotionally moving, if not riveting “The Ballad of Emmett Till” now on stage in a San Diego premiere, at Ion Theatre in Hillcrest through July 22nd. With spot on direction by Yolanda Marie Franklin and Claudio Raygoza (also credited for production design and lighting) and with a cast of six talented members playing several different characters, Till’s life unfolds all too quickly (ninety- five minutes to be exact) for the teen, but to this audience member it felt like a slow motion film in real time; one frame at a time in his all too short life. 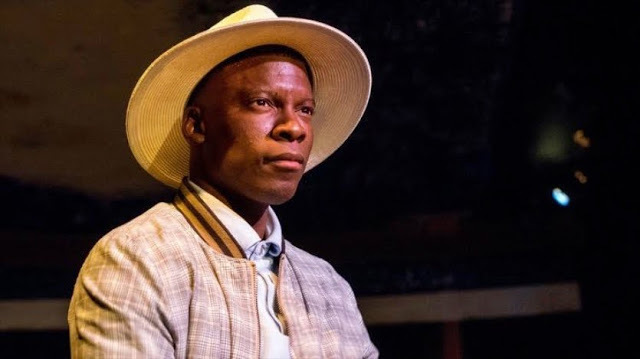 Making his Ion debut Cortez L. Johnson recently seen on Moxie’s stage in an excellent production of “Blue Door” is the main character in Bayeza’s celebration of fourteen-year old Emmett Till’s life. The killing of Till and the aftermath is said to be the impetus for the Civil Rights Movement pre Rosa Parks. Cortez L. Johnson as Emmett Till in Ion's "The Ballad of Emmett Till"
Johnson, who puts in a performance unequaled to anything seen lately, moves through Till’s short life with passion, enthusiasm and persuasion and yes, naivety when first we meet up with him pestering his mother (an effective and emotionally strong Tamara McMillian who also plays several women) to give in to his youthful whim. They called him BoBo because of a stutter he acquired as a result of a childhood bout with polio. When he was tongue tied in a struggle of not getting his words out, he would whistle. Could it be that’s what happened that night? No one will ever know. Solid support comes also from Grandison PhelpsIII, Till’s great uncle Mose, who tries to guide young Till on the art of survival in their small town. They fish together and oft time hint at ‘man talk’. Phelps III was recently seen on the Cygnet stage in their award winning productions of two of the Wilson Cycle Plays. His credentials are a proven entity. Rhys Green, Dwaine Collier, his cousin, and Portia Gregory all take turns as characters in Till’s activities and play a significant part in Till’s life as he and they weave the story together seamlessly with the change of a hat (White Panama’s were the dress of the day) or chanting together, or daring each other, or driving to places not available to them as dares, or just being. The most affecting and gut grabbing scenes come when McMillian, as Till’s mother describes how she found her dead boy, what he looked like before they cleaned him up and after they clothed him and doctored his body. Her insistence and the way she went about getting his remains brought back to his place of birth rather than being buried in some unmarked grave in Mississippi and her resolve on having an open casket for the world to see how her son was beaten drew over 20,000 to his funeral. That’s high drama at its best. Expect no dry eyes. History will only reflect that in the South 1955 Mississippi was one of the most racially charged and bigoted states (Think Jim Crow laws) in the union. They treated its ‘colored’ population worse than animals. It was American History from the 1900’s. Fast forward to the late fifties early sixties and Emmett Till was the focus of one of our chapters. I hate to admit it since I love American History, but I had only vague memories of that horrible chapter in our history that allowed the killers to go free when everyone at that trial and then some knew they were guilty but ‘violence by white’s against black’s was justified’.